Welcome to Deerwalk Retreat. A place so comfortable even the local wildlife come to congregate. Situated on a half acre, atop a knoll and surrounded by oak trees sits a 900 square foot cabin just two minutes from historic Julian California. For those looking to explore the deserts of San Diego, Deerwalk Retreat is located 30 miles from Borrego Springs. Don't be surprised if you decide to settle in though and relax for a few days. Remodeled in 2017, the cabin is fresh, bright and modern. The furniture and furnishings are brand new, purchased and placed specifically for our guests. There are two outdoor decks each with a unique view. Enjoy the morning sun from the front deck while listening to the call of Red-tailed Hawks as they begin their day. You may even see a few deer who frequent the property. The rear deck provides an excellent view of the night sky. The stars and Milky Way will take your breath away! If you prefer to stargaze while staying inside, jump into bed and look up through windows! 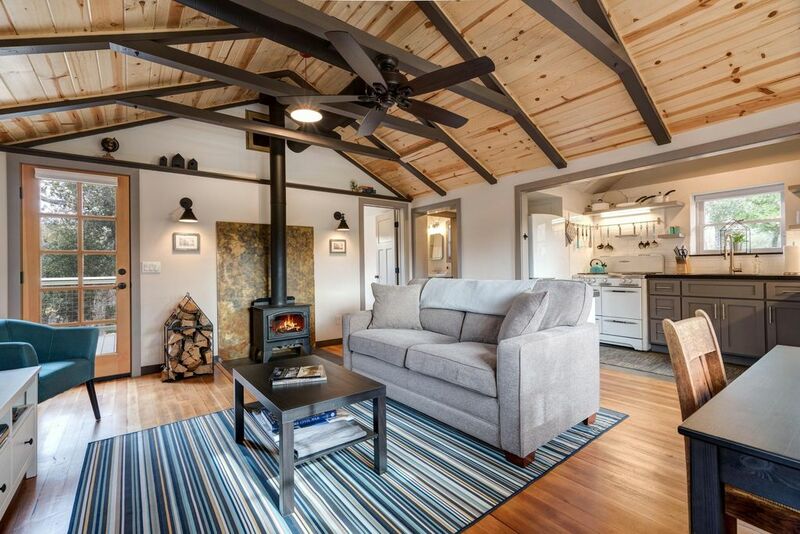 Inside the cabin, enjoy the contemporary comfort of a home originally built in 1934. The entire cabin has been renovated. The kitchen is outfitted with new appliances, except the O'keefe & Merrit vintage stove which cooks food quicker and more thoroughly than any new stove on the market today! It is a delight to use and just plain fun to think about its 75 year history of cooking! The bathroom is luxurious with heated floors and big, fluffy towels. Sit and unwind in the roomy tub with a niche for candles or stand under the adjustable rain shower head. The two bedrooms are the epitome of comfort. Each have new mattresses, cotton sheets, duvet covers and hotel pillows. The "Yellow Bedroom" is a solarium with warm sunlight and a view of oak trees and surrounding hillsides. Its the perfect place to sit and enjoy a book. The "Red Bedroom" has a flatscreen TV for those who wish to stay in bed and binge-watch a new series on Netflix. It also offers wonderful views of the outdoors from its original 12 foot wide picture window. The breakfast table is placed under a window in the morning sun. There is an additional eating bar which makes for a great place to work from your laptop. The living room is a great area to gather for games, watch TV or listen to music while sitting next to a roaring fire in the woodstove. It is equipped with the latest in technology, including a "smart" flat screen television, Dish Network and a Sonos One for music, powered by Alexa. You can ask her to turn up the heater, change the channel on TV or play your favorite genre of music. All without leaving the comfort of the couch! Deerwalk Retreat is a wonderful romantic getaway for two or a place to invite friends for a weekend in the mountains. It is also a home where your family can create memories over the years. The bedrooms are on opposite ends of the home, each having privacy. Spending time outside is even more enjoyable than being inside the cabin. Private and peaceful...well away from neighboring homes yet an easy property to locate upon your arrival. The parking area is roomy and level, important during inclement weather. Come enjoy one of the four seasons in the mountains of San Diego. At 4000' elevation, we see most of our snowfall in winter and spring. Staying at Deerwalk Retreat during a snowstorm is an unforgettable experience. Visit us in the spring to see the local daffodils and lilacs bloom. Or take a short drive to Borrego Springs and witness the wildflower bloom. It is a sight to behold! The cabin has air conditioning for warm summer days. Summer evenings are quiet and cool. You may even experience a monsoonal storm! Julian becomes very popular in the Fall with "Apple Days" festivities starting each September. Book your Fall stay with us early! We will book up quickly. The cabin is cleaned and maintained professionally. Your comfort is our first priority. If needed, there is a detached laundry room with a large-capacity washer and dryer. The grounds are maintained monthly. Snow plowing is available with 24 hr notice. Bathroom has heated floor, curved tub and adjustable rain shower head. Enjoyed getting away from it all in Julian! Great house, really enjoyed the light in the yellow room. We even got some snow. Everything was well appointed. We will be back. I've been on VRBO for a while and have stayed at many properties. This is one of those special properties that just does everything right. Comfortable kitchen for cooking, heated floor in the bathroom, stocked with necessities, comfortable and clean linens in the rooms, a smart TV with WiFi, a Nest thermostat, a Sonos One ("Alexa, play rock and roll"). There was even water bottles in the fridge and freezer and a great welcome basket of snacks. It's a great location with only some minor road noise in the morning, as the roads get really quiet at night. Easy communication with the owner. I am definitely rebooking when staying in Julian again. This place is even more stunning than the pictures show! Everything is modern in the most tasteful way. Just down the street from town. Absolutely wonderful! This cabin has all the charm of its 1930s origins but has been completely modernized and impeccably furnished. We particularly liked the heated bathroom floor and the selection of books. We didn’t use the onsite laundry but appreciate that it’s available. The living space is cozy and we pulled out the sofa bed to watch Netflix movies at night. And even though there’s central heat, we used the wood burning stove every night because, well, you can never have enough romance, right? Finally, it’s close enough to Julian to drive there in 3 minutes but you feel a world away from people if you like. We’ll be back! Had a wonderful 3 nights at the cabin. Sean was wonderful and the place is amazing. Would definite recommend to anyone looking for the place to stay in Julian.